Farmhouse by fjord near Trolltunga (1-7 beds). 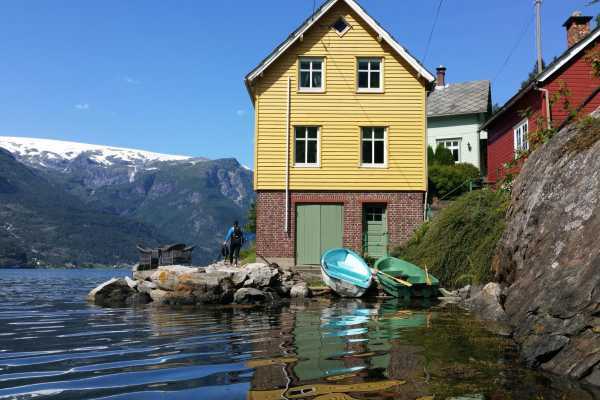 By staying right on the Hardanger Fjord, on the farm Stana Gard, you will have a great starting point to experience some of the best Norwegian nature has to offer: Namely Trolltunga! Here are also many other great hiking and exciting outdoor activities in beautiful nature: Both in the mountains, on glaciers and in the beautiful fjord landscape. From the houses and the seating outside you have a panoramic view of the glacier Folgefonna, waterfall and high mountains. If you want, you can just relax in peace and quiet in the fresh nature. The Green house is one of two houses for rent on Stana Gard. Since it is a full 7 berths in the house, it's great for business trips, families and groups of friends. During the spring and summer months you can enjoy relaxing days in the sun, go fishing right from the pier or from a boat on the fjord, have a swim and barbeque. When you rent the Green house at Stana Gard, you have the whole house just for yourself. Therefore it fits also nice for those who want a romantic setting for the holiday with his girlfriend. The price will vary with the season, and with number of persons. Cleaning fee is fixed NOK 400 per stay. Linens and towels are included in the rent. The house is fully equipped . The hosts live on the neighboring farm, and will try to meet you in the house when you arrive. If not, you will have a code for the key box by the door. 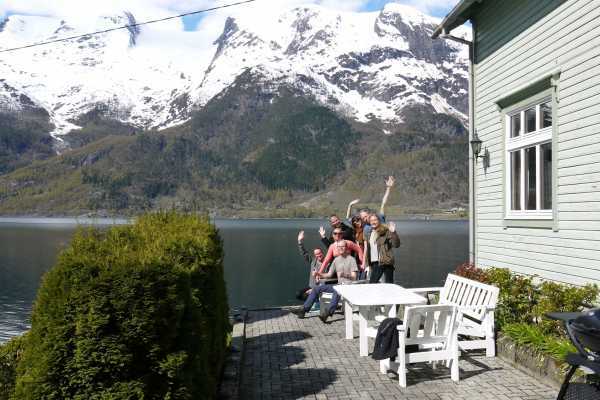 Farmhouse by fjord near Trolltunga (1-7 beds) By staying right on the Hardanger Fjord, on the farm Stana Gard, you will have a great starting point to experience some of the best Norwegian nature has to offer: Namely Trolltunga! Here are also many other great hiking and exciting outdoor activities in beautiful nature: Both in the mountains, on glaciers and in the beautiful fjord landscape. From the houses and the seating outside you have a panoramic view of the glacier Folgefonna, waterfall and high mountains. If you want, you can just relax in peace and quiet in the fresh nature. The Yellow house is one of two houses for rent on Stana Gard. Since it is a full 7 berths in the house, it's great for business trips, families and groups of friends. During the spring and summer months you can enjoy relaxing days in the sun, (or in the rain), go fishing right from the pier or from a boat on the fjord, have a swim and barbeque. When you rent the Yellow house at Stana Gard, you have the whole house just for yourself. Therefore it fits also nice for those who want a romantic setting for the holiday with his girlfriend. The price will vary with the season, and with number of persons. Cleaning fee is fixed NOK 400 per stay. Linens and towels are included in the rent. The house is fully equipped . The hosts live on the neighboring farm, and will try to meet you in the house when you arrive. If not, you will have a code for the key box by the door. Much to do for all ages. Both for those who want to go far and long, and for those who want to enjoy themselves in the surrounding area.